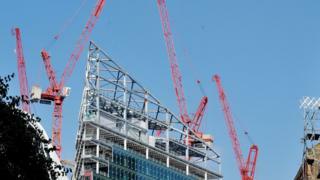 The UK economy's growth slowed in the third quarter of the year, weighed down by the performance of the construction and manufacturing sectors. Gross domestic product grew by 0.5% between July and September, the Office for National Statistics (ONS) said, down from 0.7% in the second quarter. The rate was also lower than the 0.6% growth predicted by many analysts. Part of the slowdown was due to the biggest fall in construction output in three years, a drop of 2.2%. The service sector, the biggest part of the economy, grew by 0.7%. However, output in the manufacturing sector declined by 0.3%. "The slowdown is being led by the manufacturing sector, which is seeing a renewed recession as output has now fallen for three consecutive quarters, suffering a 0.3% decline in the three months to September," said Chris Williamson, chief economist at research firm Markit. "Manufacturing output has so far fallen 0.9% this year. Producers are struggling as weak demand in many overseas markets, notably China and other emerging nations, is being exacerbated by the appreciation of sterling." We're not immune to the Chinese-led worldwide deceleration. And all the signs are that growth in the fourth quarter of the year will soften again. This doesn't mean a painful recession is about to rear up and bite us. Annual growth for 2015 is heading for a healthy, if slightly below trend, 2.3%. But it does mean the ride into 2016 may get slower and bumpier. The drop in construction output could have been influenced by particularly wet weather in August, the ONS said. "Overall, the picture of a steady recovery in the UK economy continues and we would now expect GDP growth of around 2.4% for the year as a whole," said John Hawksworth, chief economist at accountants PwC. According to a poll by news agency Reuters on Monday, economists have pushed back their average forecast of when the Bank of England will start to raise interest rates to the second quarter of 2016 from the first quarter. This is the first estimate of economic growth for the July-to-September period and makes use of only half the data which will be used for the final estimate. Chancellor George Osborne said there were more "tough decisions" to come and that his Autumn Statement, due on 25 November, would include "long-term investments for the future". Sterling fell to $1.5309 after the data, before rebounding to $1.5325, which is 0.2% lower than on Monday. "The market has pushed the first rate hike way out into the future, so I don't think today's GDP figures are going to have much impact in terms of that timing," said Bank of Tokyo-Mitsubishi currency economist Lee Hardman. What is the current state of the UK economy?